Manila, 26 September 2018 — When you are comfortable with your leadership style, it’s time to make a change and expand your toolkit. Working with hundreds of passionate business owners and executives during the BNI Philippines 4th Annual Conference was exciting. 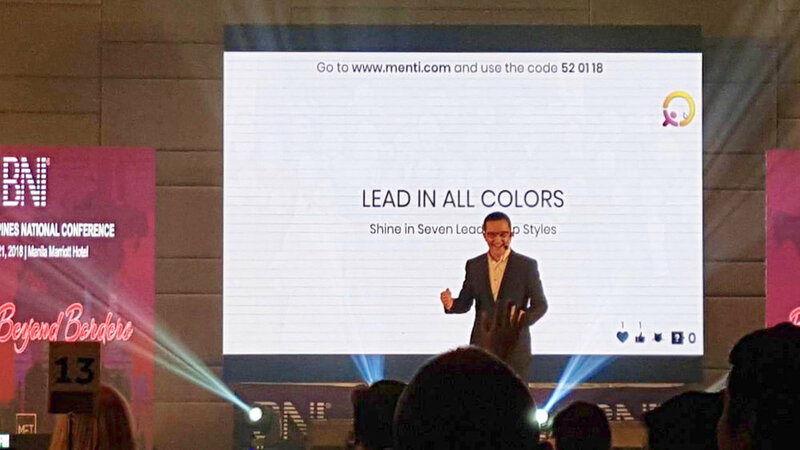 The theme was to lead their business beyond borders, and what we explored in the Lead In All Colors training was how make a start to Shine in Seven Leadership Styles. Using interaction software on their smartphones, the participants were able to react instantly to the materials presented, respond to polls, show how they will use their knowledge after the training, and send in dozens of questions to get answered, with more than a hundred upvotes. Some of the most popular questions were about knowing which of the seven leadership styles is the best for success, and if leaders should develop skills in new leadership styles or capitalize on what they are good at already. Others commented that they were used to attending many sessions about management and leadership and wondered how best to put their knowledge in practice. In our discussion, we highlighted that leadership and management are not the same, so we need to make that distinction first. Leadership is a process of influence for positive change, with direction, alignment, and commitment. Lead In All Colors is a simple and powerful framework to practice seven different leadership styles. You show up as an effective leader when you choose to use a style that suits the need of your audience and the situation at hand. By learning to practice your self-awareness and situational awareness, and by expanding your toolkit of skills in the seven leadership styles, you get better at showing up with the effective leadership behaviors that each situation calls for. You need to practice this every day and ask for feedback regularly, from peers, mentors, and coaches. The best style, therefore, depends on the audience and the situation you are in. Effective leaders are masters in matching their style to the situation they are in, allowing them to make the best contribution. This is why Lead In All Colors offers a framework of seven leadership styles to learn and practice. Regarding developing new skills or capitalizing on existing strengths, the recommendation is that you do both. Master the style(s) that comes more naturally to you, and stretch yourself to learn new styles and master those too. This will allow you to become an effective leader in any situation you are in. In summary, the key to success is being able to choose and master the Leadership Style that best fits with each of your audiences and situations you are in. To become an effective leader, you need more than one tool in our toolbox. Lead In All Colors offers you an effective toolkit of Seven Leadership Styles. When you know that attending leadership training boosts your interest, how to get organized and start in the right way? Yes, we know that good intentions are not enough. The following three practices can help. First, adopt a simple yet powerful framework makes it easier to get started. Second, it helps if you tap an emotional drive to do so, for example a strong desire to level up, or a strong determination to avoid situations where your performance is found to be inadequate. Third, decide to learn and practice together with others (peers, mentor, coach) and agree on being accountable for making progress. You can find a visual model below about the need to change colors if you want to change the world, starting in the situations you find yourself in. Whether you use the colors for communicating effectively or for choosing a leadership style that fits your audience and situation, this 3-stage model applies. In the first stage, you select which of the seven colors you will use in your situation with your audience. This requires that you have developed an adequate awareness of yourself and your audience and the situation you’re in. You also need a good working knowledge of the seven colors and what they stand for, and an open mind for choosing a color of leadership or communication style that you think will work best. In the second stage, you use your knowledge and skills of how to use that color’s leadership and communication style to good effect in your situation with your audience. Doing so, you enact a new experience that becomes possible when using that style. You cultivate an open heart and build trust. In the third stage, you and your audience, the people you are working with in the situation, get to generate new and better solutions and results, and this is made possible by the experience of effectively using the color you have chosen for the interaction. While you still may have some pre-conceived goals, it is important in this stage to be open to deciding new courses of action, with an open will. Do these stages make sense to you already?